Debate Students Get Accepted to the Best Universities in the U.S. 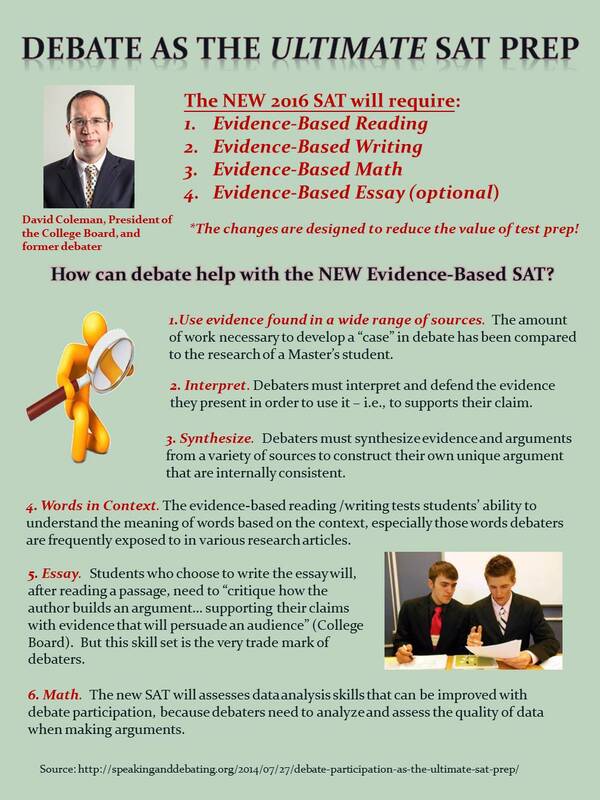 The new SAT was designed by a former debate champion, David Coleman, the President of the College Board, and requires debate skills more than ever. Therefore, debate students get higher scores on all standardized exams. Sponsors of competitive speech programs must prove scientifically how forensics improves student achievement, as defined by No Child Left Behind (NCLB; 2001). While many studies have shown a connection between debate experience and improved critical thinking skills, few studies have linked competitive speaking specifically to the standardized tests required by NCLB. This researcher examined the state and national test scores of similarly motivated honors English students in a single high school, over the course of 4 years, and compared the scores of forensic students against the scores of non-forensic students. It was found that students with experience in competitive speech scored significantly higher (α = 0.03) on state administered writing tests and significantly higher (α = 0.07) on a nationally normed reading test. 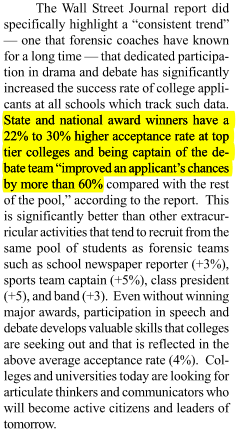 Additionally, this study revealed no significant difference in test scores between students who competed in the debate events vs. those students who competed in the non-debate events. In China, the U.S. debate has received wide acceptance already. This video shows how U.S. Style debate is practiced in China. That is because China has seen visible benefits of debate. There is no other activity that stimulates your child’s brain more powerfully than debate! Try it! I guarantee it. These are the short term, long term, and life time benefits to debating.